My third new recipe for 2017! Anyway, I used up Sofia's Russet potatoes to make then. Which then I regretted so much! Because it so happened that just at that time she was hungry and I only have secebis epal kukus. Geram. Because the potatoes were in the fridge for so long and just when I just added black pepper, salt, and flour to it, MASA TU LAH NAK MAKAN.... But it was my fault also. Secebis epal mana cukup. Should have at least left one cut of potato for her. Sofia crying for more food got me stressed and I ended up steaming all her apples and the remaining potatoes. Anyway, making this took me days. Yes, a simple recipe. 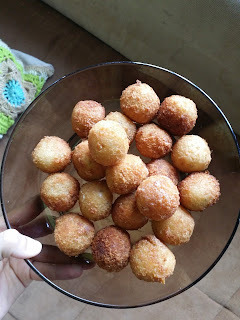 One day to mix the potatoes with salt, black pepper, and flour, and shape them into small balls. Another day to put in cheese inside the balls, and cover the balls with bread crumbs. The next morning baru boleh goreng dan makan. Because the potatoes were just remainings of Sofia's, I managed to get only 13 balls. The ingredients are simple; potatoes (I use Russet because the texture is more smooth. Kukus. ), salt, black pepper, flour, cheese (cheddar), bread crumbs (I made my own using the burger bun, grated), egg (celup telur, golek di serbuk roti). Put them in the freezer, and simply fry it api perlahan. Siap! I have a confession to make. 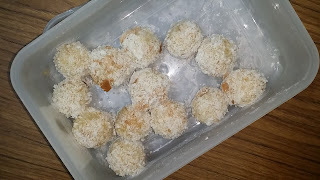 After successfully making them for the first time, a few times after that I failed. When I fry them, terburai pecah... When I fry them, hangus... When I fry them, melekat di kuali. I made them again. Alhamdulillah, turned out very good! 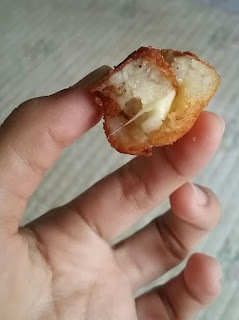 When I said VERY GOOD, it means that it turned out a golden brown, the cheese melts (inside the balls, instead of pecah terburai digoreng sekali), and it didn't stick in the pan. Tips I just learnt from my mum; minyak panas betul, tapi perlahankan bila menggoreng. And the cooking oil filled up til around 3/4 of the balls. Oh. I added a piece of asam keping into the pan just in case melekat lagi. But my mum said it's the heat that determines it. Lain kali kita cuba lagi. Heheh. Beberlit lidah saya. Saya kurang faham sikit dgn bi. Mungkinla. Next time buat banyak lagi. Tak banyak pun. Takat macam sprinkle sikit-sikit je.